Add a bunch of high-power outputs to a microcontroller system with chainable shift registers. These chips take a serial input (SPI) of 1 byte (8 bits) and then output those digital bits onto 8 pins. You can chain them together so putting three in a row with the serial output of one plugged into the serial input of another to make 3 x 8 = 24 digital outputs. You can chain pretty much as many as you want. This makes it easy to control a lot of outputs like LEDs from only 3 digital microcontroller pins. 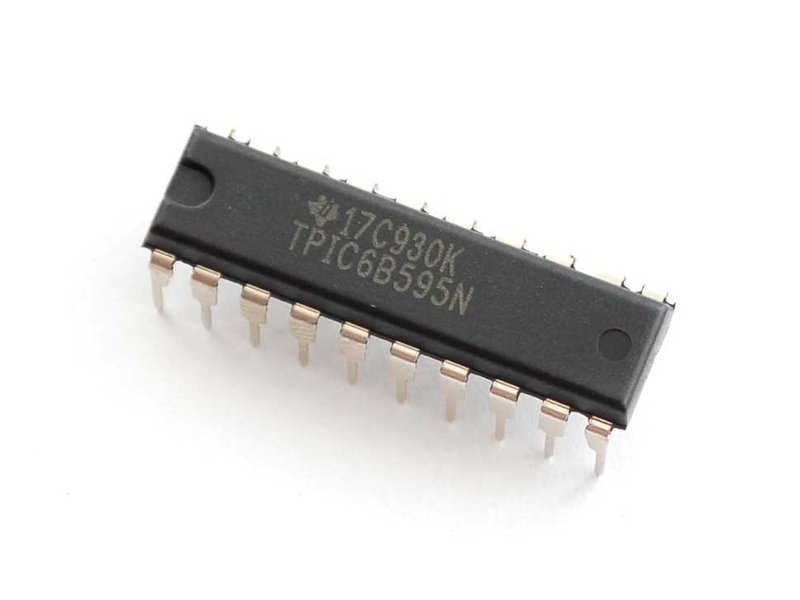 This item contains one TPIC6B595 chip! These chips similarly to the more well known 7HC595s but they are high power drains, able to sink 150mA per pin. They cannot source current so they should be connected to LED cathodes. This makes them ideal for use with LED matrices where you end up sinking 8 or more LEDs at once. These chips are DIP package so you can easily plug them into any breadboard or perfboard with 0.1" spacing. They are not the same pinout as '595s so check the datasheet!